In Italy, home cooks use a simple focaccia-ish dough to make the tray-style pizza alla casalinga ('housewife pizza'), without the bells and whistles of pizza professionals. This inspired the New York grandma pie, a perfect style of pizza to make at home. 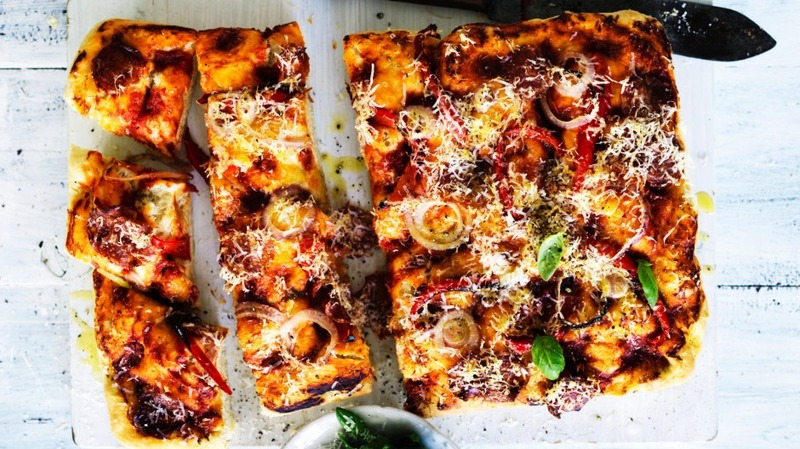 Any recipe for this simple pizza should be treated as a rough guide only. Change the toppings, proof it or don't, add the sauce first and then the cheese if you like. Combine the flour, yeast and 1 tsp of the salt in a large bowl and stir to combine. In a separate bowl or jug, combine the oil and 400ml of lukewarm water. Make a well in the centre of the flour mixture and gradually add the oil and water mixture to the dry ingredients, stirring with a fork until the dough forms a shaggy ball. Tip the dough out onto a lightly floured board or bench and knead for about 5 minutes until the dough is smooth and elastic. Generously grease a 20cm x 30cm baking pan. Press the dough into the pan, squashing and stretching by hand so that it fits into the pan, pushing with your fingertips right to the edges. Cover with a tea towel and leave in a warm place for about half an hour, until the dough rises to about one and a half times its size. You can skip this proofing step if you prefer, but your pizza will be a little more dense. Heat your oven to 200C. Stretch the dough into the corners of the tray and press down firmly with your fingertips to knock out the air and leave small indentations. Scatter the mozzarella cheese over the top of the dough, and spoon over a few tablespoons of tomato passata. Scatter with the roasted capsicum, onion and salami. Drizzle everything with olive oil. Bake the grandma pizza for 20 minutes until the dough has risen, the cheese melted and the salami is crisp. Remove from the oven, cut into squares and serve with my olive and parmesan slaw. *Adam's tip A simple and fresh tomato passata is all you need to top a grandma pizza. But if you like you can make a slightly richer sauce by frying a little onion and garlic in olive oil, adding passata and a few herbs, and cooking it for 10-15 minutes.